Three of the five westbound lanes along U.S. 20-26 (West Front Street) transitions onto the freeway viaduct leading out of Downtown Boise to Interstate 184 at Garden City. Photo taken by David Stybr (06/03/06). 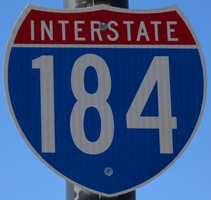 Interstate 184 is the Boise Connector, a freeway spur east from I-84 & U.S. 30 to the Boise city center. With as many as eight overall lanes, I-184 connects with a retail strip anchored by Boise Towne Square mall at Franklin Road and with U.S. 20/26 at the south end of Garden City. U.S. 20/26 extends the freeway 1.1 miles east from I-184 across the Boise River to the arterial couplet of Front and Myrtle Streets through Downtown Boise. 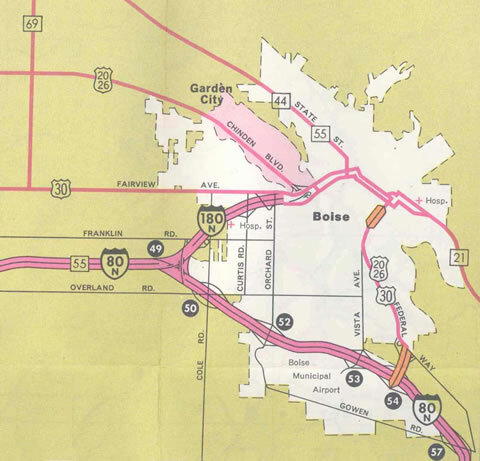 The Boise Connector appeared on planning maps since the 1960s. The freeway opened east from Interstate 80N in December 1968.1 It was approved as Interstate 180 by the American Association of State Highway Officials (AASHO) on June 30, 1970. Idaho Official Maps and various state maps printed in the 1970s showed I-180 as Interstate 180N in the 1970s, referencing Interstate 80N, the designation of I-84 prior to 1980. 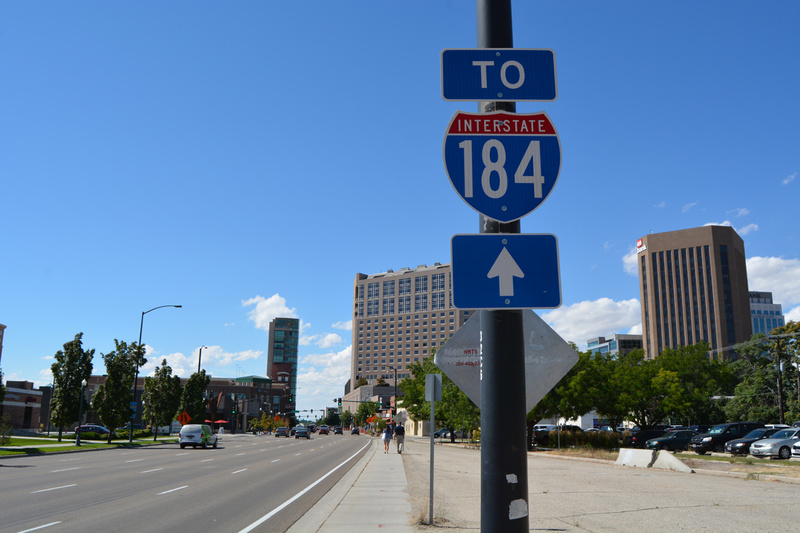 The American Association of State Highway and Transportation Officials (AASHTO) approved the renumbering of I-180 to Interstate 184 on October 13, 1979. The conversion of I-80N to I-84 was completed by July 1980. During this time period, Interstate 184 in Boise was also briefly signed as Business Loop I-84. Running along side U.S. 20 and U.S. 26 for a portion of its length, the business route was ultimately eliminated to reduce duplicative designations. 1976 Idaho Official State Map showing Interstate 180N and previous alignments of U.S. 30 and State Highway 55. Interstate 184 drops below grade ahead of Orchard Street and the half diamond interchange (Exit 3) with Fairview Avenue. Fairview Avenue parallels along the north side of the six lane freeway. Photo taken 08/09/16. Fairview Avenue separates into one-way service roads between Orchard Street and U.S. 20/26 (Chinden Boulevard) at Garden City. Exit 3 constitutes a slip ramp onto Fairview Avenue east to West Downtown Boise. Photo taken 08/09/16. Interstate 184 ends at the wye interchange bringing U.S. 20/26 eastbound onto the freeway from Garden City. The elevated highway continues a half mile east to an unnumbered exit for River Street and one mile to the couplet of Myrtle/Front Streets at 13th Street. Photo taken 08/09/16. Overheads precede the U.S. 20/26 separation with Front Street at 13th Street and the freeway viaduct leading west to Interstate 184. Photo taken 08/09/16. 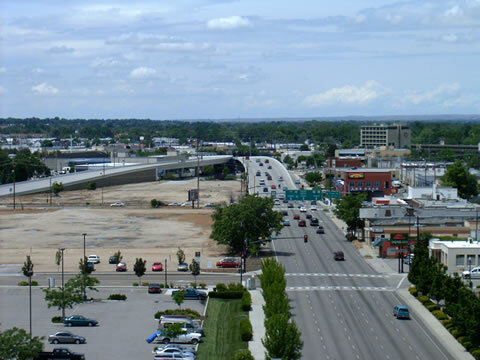 U.S. 20/26 elevate across 15th Street and Americana Boulevard from West Downtown Boise to Garden City. Interstate 184 begins at the wye interchange with Chinden Boulevard in a half mile. Photo taken 08/09/16. U.S. 20/26 angle northwest along Chinden Boulevard, a five lane commercial boulevard through Garden City. Interstate 184 takes over along the Boise Connector west 3.6 miles to I-84 east of Meridian. Photo taken 08/09/16. I-84 & U.S. 30 enter the city of Boise from Merdian two miles ahead of Interstate 184 (Exit 49). Photo taken 08/09/16. Four lanes advance east below the Five Mile Road overpass, one mile from the directional T interchange (Exit 49) with the Boise Connector. Photo taken 08/09/16. 1999-2004 reconstruction of “the Flying Wye” interchange added a three lane flyover for Interstate 184 east to the Boise city center. I-84 & U.S. 30 east maintain three lanes as the freeway turns southeast to Boise Airport (BOI). Photo taken 08/09/16. 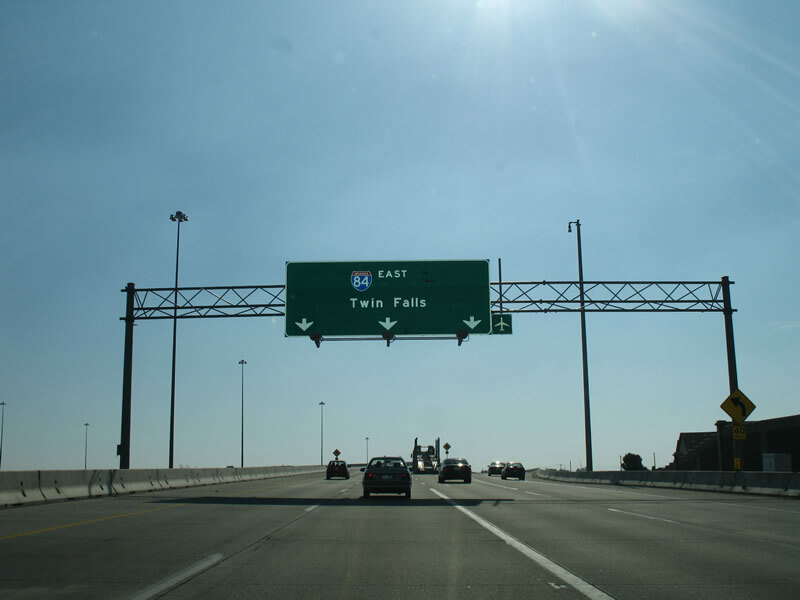 Left Exit 49 departs from I-84 & U.S. 30 east. Exit 1A follows from I-184 to Franklin Road while Exit 50 circumvents oncoming traffic to I-84 east from the Boise Connector to Cole and Overland Roads. Photo taken 08/09/16. I-84 & U.S. 30 bee line northwest from Boise Airport (BOI) toward Interstate 184 east to Downtown. ITD recorded 89,500 vehicles per day (vpd) on this stretch of eight lane freeway in 2017. Photo taken 08/09/16. Cole and Overland Roads intersect directly above Interstate 84 ahead of the Boise Connector (Exit 49). I-84 was reconstructed here in 1996. Photo taken 08/09/16. 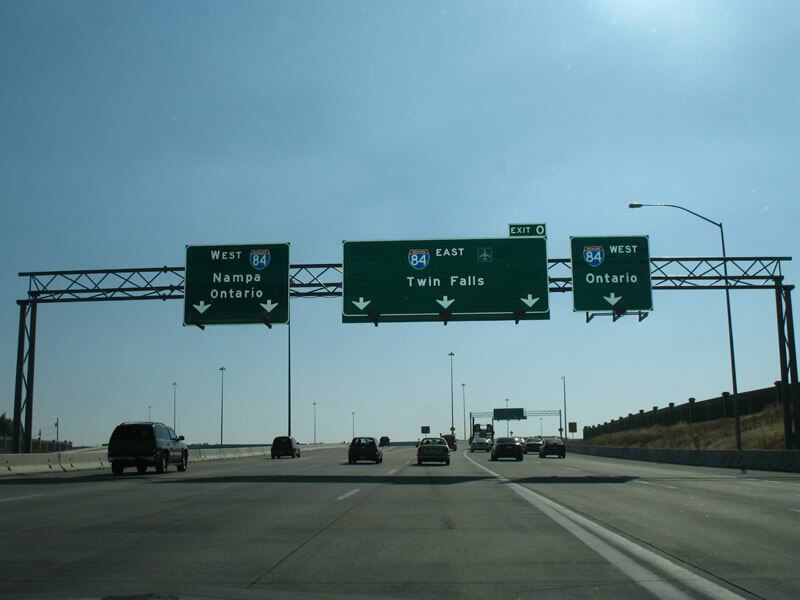 Exit 49 separates from I-84 & U.S. 30 west for Interstate 184 east below the entrance ramp from Cole Road. A slip ramp to Franklin Road follows. Photo taken 08/09/16. Replaced guide signs preceding Interstate 184 at the six-ramp parclo interchange (Exits 50B/A) with Cole and Overland Road. Photo taken by Steve Hanudel (05/17/06). Two miles ahead of the directional T interchange (Exit 0) with Interstate 184 on I-84 westbound approaching Exit 1B to Cole Road and Boise Town Square mall. Photo taken 08/09/16. A folded diamond interchange (Exit 1A) joins Interstate 184 with Franklin Street a half mile north of the ramp split for Interstate 84 & U.S. 30. Photo taken 08/09/16. The left two lanes of Interstate 184 westbound connect with I-84 & U.S. 30 west to Meridian, Nampa and Caldwell. The two lane entrance ramp from Franklin Street joins the eastbound ramp (Exit 0) for I-84 & U.S. 30 to Boise Airport (BOI) and Mountain Home. Photo taken 08/09/16. The westbound on-ramp from Franklin Street partitions ahead of the three lane flyover for Interstate 84 east to Twin Falls, Pocatello and Salt Lake City, Utah. Photo taken 08/09/16. Interstate 184 west at the previously unnumbered diamond interchange with Curtis Road. Photo taken by Zachary Maillard (10/00). 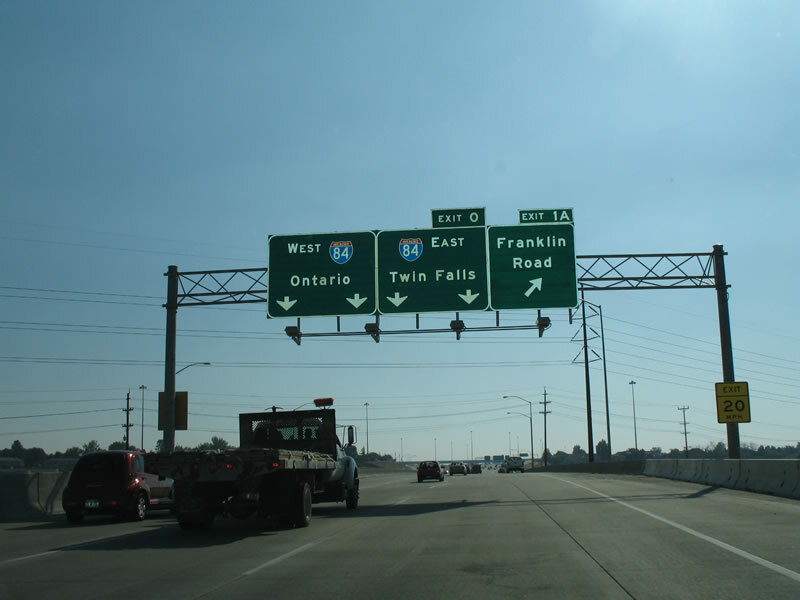 Previous guide signs at the west end of I-184 used Ontario and Twin Falls for Interstate 84. Photo taken 08/31/06. “Rebuilding the WYE interchange.” Idaho Statesman (Boise), February 7, 1999. “Speeds will return to normal near Wye.” Idaho Statesman(Boise), September 5, 2004. Page updated March 1, 2019.